Richard and Medina Brock started their B&B with just one room in the charming stony buildings of Brandy House Farm. It wasn’t long before things took off, however, and once you’ve stayed here for a night or two it’s easy to see why. Their warm friendly welcome, a breakfast that has been awarded the title of ‘Best in Wales’ (seriously) and local knowledge that extends from the endless surrounding footpaths to the tastiest places to eat. The Brock’s are the perfect hosting team and, with the obvious support of their quaint 20-acre farmstead and a picture-perfect countryside backdrop, they can now boast one of the most highly acclaimed B&Bs in the country. But this is walker’s country. Poised in a lush green valley, the River Teme meanders lazily along the edge of a B-road that leads to the farm, its glistening waters marking the boundary between England and Wales. The slopes that drop down around the river are criss-crossed by streams, footpaths and bridleways creating an outdoor playground for anyone with a mind to get out and explore. 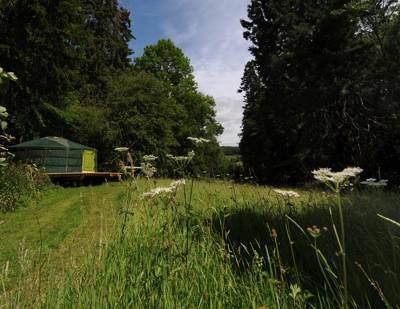 Despite the warmth a B&B may exude, the stunning natural scenery calls for accommodation of the more Cool Camping kind and, here too, Richard and Medina haven’t missed a trick. 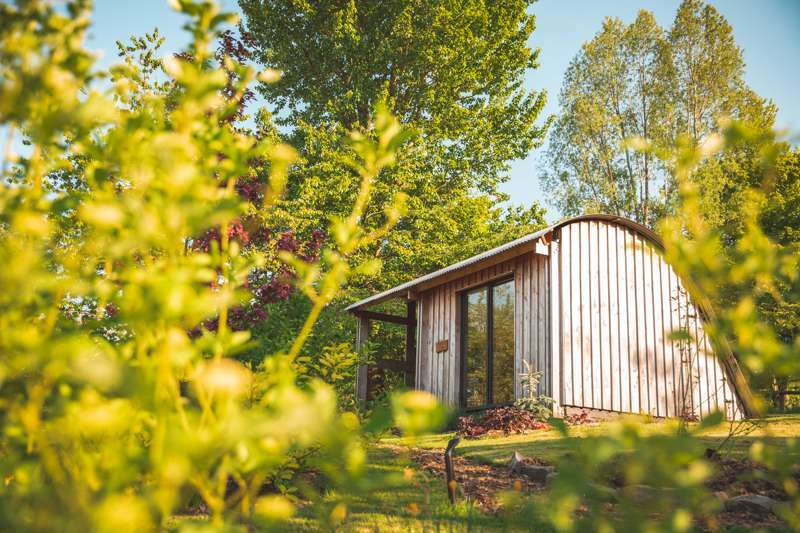 A few hundred yards from the farm buildings, in its own space, part garden part hillside glade, their MorphPOD nicely fits the bill between B&B comfort and mountain-man escapism. Floor-to-ceiling double glazed windows let the outside in and allow you to wake up admiring views across the Teme Valley, while fold down beds provide ample space and comfortable room for four to sleep. 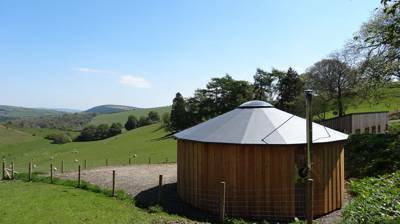 For easy access, theres's a waterless toilet, a odour-saving 20 yards away, and those looking for the extra household comforts can head into the farm buildings to find a hot shower, laundry facilities and wireless internet. It goes without saying that the famous breakfast is still available, delivered to the pods stable-style door in the morning; cooked by Richard with locally-sourced produce. 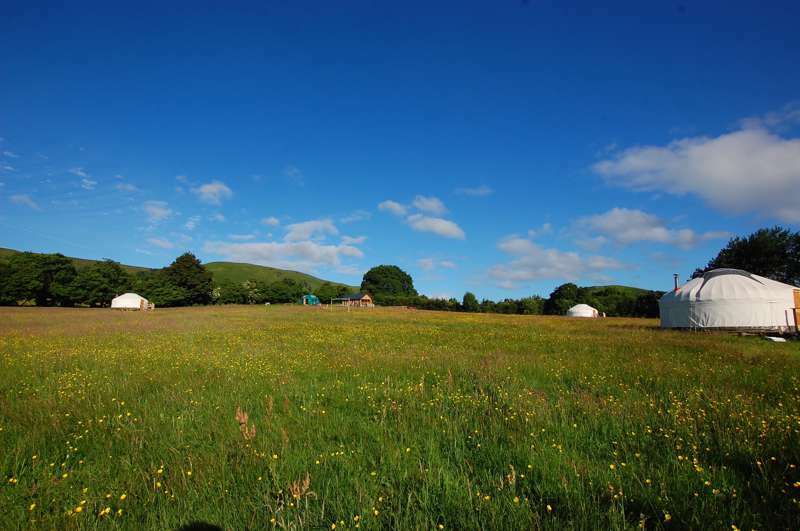 But for all the creature-comforts, those wanting the real deal can pitch up in the small 'wild camping' area, set aside for a limited number of tents. And when we say Richard and Medina haven’t missed a trick, we mean it. The MorphPOD is suited to the outdoorsy types for more than just its open views and awaiting campfire-pit. Mountain bikers and cyclists can make use of the handy wash down facilities and flick through a helpful route portfolio, while those looking to saddle up and head off on hoof are even better catered for. The 12 stables and individual paddocks for turning out your horse, means riders have accommodation for both themselves and their trusty steed. Whether you walk the Welsh national trails or canter cross-country to explore the English bridleways, it’s worth chatting with Richard and Medina who know the area well. If you make it back by dinnertime you can even ask them for another farmhouse meal, though cooking your own beneath the stars is the best way to enjoy the MorphPOD’s veranda and the pleasant garden in which it resides. For latest availability and best prices for Brandy House Farm, please use the Date Search above.